I've just thoroughly enjoyed the first show in Lincoln, based on songs from musicals old and new, with a talented cast that appealed to an audience across the generations! 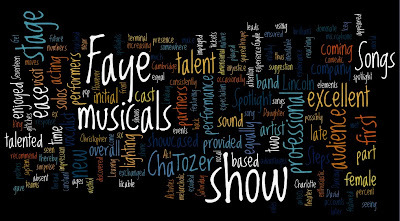 My initial response to my daughter's suggestion, that we visit a show based on musicals during our visit from Cambridge, was less than enthusiastic – until she mentioned that it featured Faye Tozer (ex Steps)! Daughter, parents and grandparent thus sat down in the Drill Hall in Lincoln with the expectation of seeing “In the Spotlight: Songs from the musicals” featuring Faye with a supporting cast. It was with increasing surprise and delight that I found myself enjoying new talent sharing the stage as justifiably equal partners. The show really gelled for me by the time it reached “Seventeen” from “Slice of Saturday Night” with assured performances by what I initially thought were clear male and female leads of the troupe. Christopher Finn shone as a vocalist with a sense of comedic acting and petite Rebecca Wicking consistently displayed an excellent voice and exuberance that gave her a much larger stage presence. Only to find that later numbers showcased an equally talented Annabel King who tugged at the heart with the more wistful and melancholic solos and duets and Mark Daley and Tom Garner completed the primary vocalist talent and attracted the attention of the female audience. Dancing was an integral part of the show and the further six dancers/vocalists not only enhanced the overall performance, they also entertained as pairs in Act II; with Ellie Cobb and David Kemp (I believe) performing a sizzling tongue in cheek Cha Cha Cha. Music was professionally provided by the live band, on a raised dais at the back of the stage, such that it provided the reassuring constant and excellent support for the performers and the continuing thread for the audience. With this being the very first time performers, lighting, sound system and band performed together, there were the inevitable glitches. Future shows will be spared the late or absent microphone fade-ins which did injustice to the voices of both Lindsay Shaw and Charlotte Gayle during their solos; the spotlights occasionally not reaching the artists at the very front of the stage; and the tap dancing by the whole group awaiting that final last percent of synchronization to make it brilliant. However, whilst possibly terminal for the sound and lighting teams if not addressed, these elements only marginally impinged on the overall enjoyment of the show. But what about my initial reason for coming, Faye Tozer? Faye impressed me on two accounts. First, her vocal range and delivery were excellent - and the acting experience in the years since I'd seen her in Steps was obvious in the different roles she played. She exuded the subtle aura of an experienced professional performer at ease in the show she was playing in. Second, she refrained from using these advantages to dominate the show to the detriment of the new talent, allowing them to shine too. Faye thereby ensured that this was a true company presentation. Her confidence and ease with herself and her partners appeared to me to be a key part of the success and nature of this company; one that could have been equally represented on the fliers, posters and program covers. Leaving the theater late, we unexpectedly met Faye Tozer relaxing with her son outside and exchanged a few friendly words. These reinforced my impression of a professional artist and person at ease with herself and the world. I'd come with a two dimensional memory of a 1990's manufactured pop star and discovered a 2010 likable professional artist and human being; I'll be looking out for her in future productions. Our family enjoyed the very first performance of “In the Spotlight: Songs from the musicals” and I would recommend it as entertainment for musical song lovers of all ages. Get your tickets now if they are coming to somewhere near you! Information and booking available at www.spotlightontheuk.com.